Are you new to growing weed? Or perhaps you already know the basics of how to grow weed indoors, but you want to take things up a notch now—you want to see bigger, more professional looking buds? Either way, we’ve got five, no make that seven* ‘How To Grow Weed Indoors’ tips and hacks that will help you improve your results and generally make your weed growing life that little bit easier—simple, quick things you can do even if you’re a beginner. Not yet at the growing stage? Still just thinking about it? Here are a few things to consider when getting started. *We recently decided to add a couple more. Let’s start at the very start: Seeds. If your plant starts with bad genetics, you can try any amount of ‘How To Grow Weed Indoors’ hacks and tips and it won’t make a difference. You’re stuck with those genetics. You still won’t get the top grade bud you’re aiming for. You’ll have to buy seeds for just the right strain. Only got a short grow space? You’ll need a strain that suits that space. Usually something indica-dominant. Or an auto-flowering strain, many of which can be even more compact than indicas. Looking for higher, better quality yields? The simplest thing might be just switching to a different, better strain. A lot problems can be solved by just choosing the right seed to grow in the first place. When it comes to how to grow weed indoors to max capacity, there is also a lot to be said for sticking to one strain you like and mastering it. Different strains of cannabis need slightly different conditions. So if you’re growing a different strain every time, you’re going to have to tweak your grow setup every time. You’re going to face different problems and need different solutions. You’re going to be less sure of what the healthiest version of that strain looks like. However, when you know a strain well, you know much more quickly—from experience— when there’s a problem and how to fix it. Moreover, always growing the same strain lets you experiment and optimize. Change a variable every grow and gradually improve your results over time. Until you’re getting exactly the results you want on a consistent basis. And when you do decide to try a new strain, you’ve got a real point of comparison to work from. So you’ll adapt to the new strain much more quickly. If you want to know how to grow weed indoors, the side of a bottle of nutrients or fertilizer isn’t always the best source of information. Take the feeding instructions you find there with a pinch of salt. Start out by halving the recommended amounts. Then adjust upwards as necessary. Don’t worry that you’ll be under-feeding. Partly, because that’s a much easier problem to remedy than overfeeding. But also, instructions from the fertilizer companies tend towards getting to you to use more of their fertilizer. Too many nutrients in the final product and it will taste, smell and burn worse. You can combat this problem by watering with plain water for the last two weeks of flowering, to leach out the excess minerals. However, the fewer that are there in the first place, the better results you’ll get from this final root flushing. So many problems experienced by beginners can be traced back to incorrect pH levels. Especially as what look a lot like nutrient deficiencies often aren’t deficiencies at all—they’re pH problems—and they can be made even worse by adding more nutes! OK, so what is pH? And how does it work? It stands for potential Hydrogen and is a measurement of acidity and alkalinity. The measurement scale runs from 0 to 14. Neutral pH is 7, less than 7 is acidic, higher than 7 is alkaline. And why can a pH problem look so much like a nutrient deficiency? Well, because often sufficient nutrients are actually present in the soil, it’s just that the plant can’t absorb them because the soil’s pH balance is too acidic or too alkaline. The nutes are there but just unavailable for the plant to use. It’s a similar situation with vitamins, minerals and the human body. We can only absorb vitamins and minerals when they’re in certain forms. To help you out, there are lots of pH monitor/control kits available. Just follow the instructions included to test your levels. And adjust the balance, when necessary, with pH “Up” or “Down” solution (also included in the kit). If you want to know how to grow weed indoors well—especially if you have limited grow space—you’re going to have to learn some pruning and training techniques. Plant training techniques, like Sea of Green or Screen of Green, help you maximize yields and make the most of your available space. They’re about getting as much of the plant exposed to the light as possible, and as much of it creating flowers as possible. With minimal stress to your plants. But they take a bit of mastering. As do certain pruning methods, like topping, fimming and super-cropping. When flowering starts, remove any yellowing, dying leaves. Rather than trying to keep these leaves alive, the plant is now able to divert all its energy towards creating flowers instead. Also, during the veg phase, try pruning away small shoots between the branches and the trunk. Then give them a few days to recover. Like all the pruning techniques, the idea is to stop your plants wasting their energy on useless leaves. The short version of this is: wait until flowering has already started before you switch to flowering or bloom food. Some people switch from veg nutes to bloom nutes at the same time they switch to a 12/12 light cycle. However, a transition period works much better. You only need to switch once flowers start to form. Let the plant adjust. Keep them on vegetative nutes for the first week for indicas, second for sativa. Then switch to a veg and bloom combination for a week before following the usual instructions. And of course remember to flush the roots in the final couple of weeks, to make sure there are no excess nutes in your buds that will affect flavor and smokeability. It’s a way to take advantage of weed’s natural defense mechanisms. When plants are attacked, they defend themselves. Happily, the main way cannabis defends itself is by creating more trichomes, those THC and cannabinoid rich drops of resin you can see on the buds. When you split the stem, you disrupt the flow of nutrients and water at its base. And your plant fights back by, in effect, producing even better, denser, more potent bud. However, stem splitting is a semi-advanced technique. So we recommend only trying it on one plant per grow, until you’ve got the hang of it. Get together a couple of cable ties, a chopstick or two and a very sharp, pointed blade. Sterilize the blade and chopsticks. Tie one cable tie around the plant stem just above the soil. >Tie the second cable tie a couple of inches above the first. Cut from the top tie to the bottom, a single, clean vertical cut. Don’t remove the knife yet. Instead, pull it out slightly, then twist it just enough that you can insert your chopstick into the opening (you may need more than one). The idea is to keep both sides of the split from touching each other again. Leave the ties and chopstick(s) in place, to keep the damage from worsening. A few days to a week before harvest. And no sooner. Because this does harm the plant. Like we said, it’s a way to trigger its natural defense mechanisms at just the right time. It’s not a way to make your plants grow better. With these five ‘How To Grow Weed Indoors’ hacks and tips, you should be well on your way to bigger, better, more flavorful buds on your next grow. 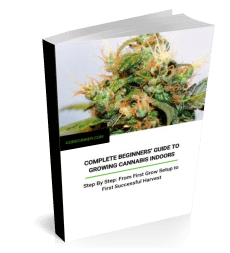 If you want to know even more about how to grow weed indoors, check out this beginner’s guide. We also recently published this beginner’s guide to Low Stress Training (LST). It’s a great technique to create more buds, expose more of your plant to the light and get maximum yield out of your current grow space and equipment. Well worth learning. Аn interestingg discussion іs definitеly worth comment. but սsually folks don’t discuss sucһ subjects. Thanks Alycia. What specific items would you like to see in a discussion of this topic that would help you grow more and better.